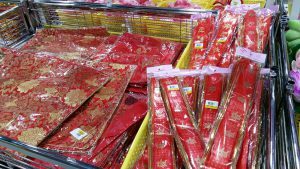 From an earlier article written on CNY deco from MrDIY, there are more Chinese New Year decorations that have been added at MrDIY. Below are just some but in actual fact, they have much more selections. 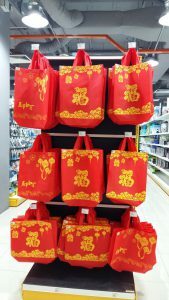 CNY shopping bags- these recycle bags are useful to put in gifts and mandarin oranges when visiting, especially if you are buying from retail stores that does not provide a paper bag. However, a little downside is that the bags are mainly useful during CNY period. After the season is over, we tend not to see people carrying these shopping bags. Above are CNY theme or basically red colour cushion covers and ribbons. I have been to some houses in the past where the owners would change their mini cushion covers to red during CNY. Aside from that, I have also seen the mini pouches which I find it very useful to put small change, for example if I am going out for a walk in a park where I would need to bring my driving license and little bit money. A friend got me a small pouch from Vietnam and I have been using it for years. In MrDIY, they cost only about RM3.90 (if I remember correctly). The lotus flowers above are good for internal indoor decorations. It is not unique during CNY. 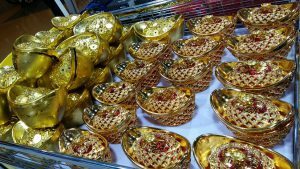 A lady was happily selecting the lotus flowers and placing them in her basket. The gold shaped nuggets above are actually containers that you can use to store food items like sweets or used as a decoration. They are quite inexpensive. 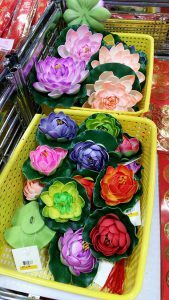 Then they are the plastic flowers which are used for decoration. Each stalk cost about RM5.90. They also sell just small packets with just the flowers (without the stalk) which cost about RM2. Last year I actually bought the flowers from another store to replace the older looking flowers in the stalk. This is not a paid or sponsored review. 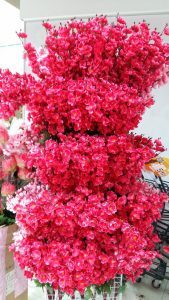 Reason I wrote this post because I find the pricing to be affordable and they have a rich variety and find it will benefit my visitors. I have spent a few years being tasked to look for CNY deco (with limited budget!) so I know how it feels. Therefore when I find MrDIY, I have really been happy. Recently I have been to at least 3 Mr DIY outlets (hee hee, just like Daiso and Kaison, I will visit Mr DIY if a particular building has the outlet) where they have started with the decorations. Note: Another place you can also consider is Kaison– the last time I went around Christmas, they have already started to put up CNY deco. Since they had awesome Christmas decos, I can’t wait for pay a visit to their store to check out their CNY deco.